Unsolved homicides and missing persons cases in Utah number more than 200. (Scott Sommerdorf | The Salt Lake Tribune) Utah Cold Case Coalition co-founder Karra Porter speaks about proposed legislation, nicknamed Rosie's Bill, that would lobby for a centralized database for all cold cases in the state, Thursday, January 18, 2018. The photo above Porter is that of six year old Rosie Tapia, who was murdered 23 years ago. Her case remains unsolved. (Scott Sommerdorf | The Salt Lake Tribune) Lewine Tapia, the mother of cold case victim Rosie Tapia, whose photo is reflected in the table, below, speaks about proposed legislation, nicknamed Rosie's Bill, that would lobby for a centralized database for all cold cases in the state, during a press conference with the Utah Cold Case Coalition, Thursday, January 18, 2018. 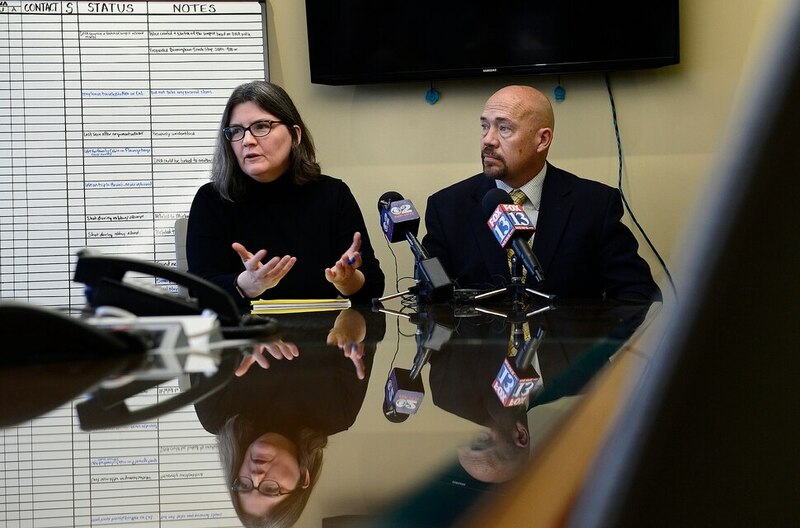 (Scott Sommerdorf | The Salt Lake Tribune) Utah Cold Case Coalition co-founders Karra Porter, left, and Jason Jensen, speak about proposed legislation, nicknamed Rosie's Bill, that would lobby for a centralized database for all cold cases in the state, Thursday, January 18, 2018. (Scott Sommerdorf | The Salt Lake Tribune) Lewine, and Roberto Tapia, the parents of cold case victim Rosie Tapia, during a press conference about proposed legislation, nicknamed Rosie's Bill, that would lobby for a centralized database for all cold cases in the state, Thursday, January 18, 2018. 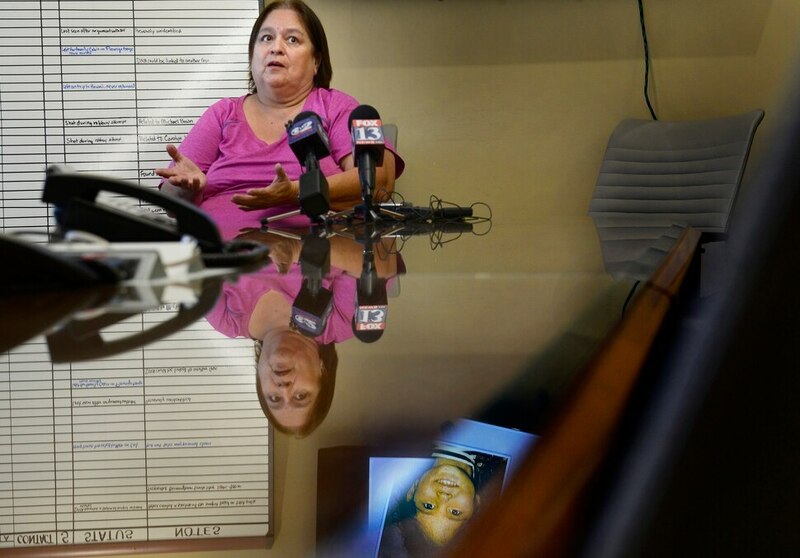 There are some 200 cold cases of murders or missing persons in Utah, yet the state has no comprehensive up-to-date database that would help law enforcement bring perpetrators to justice. 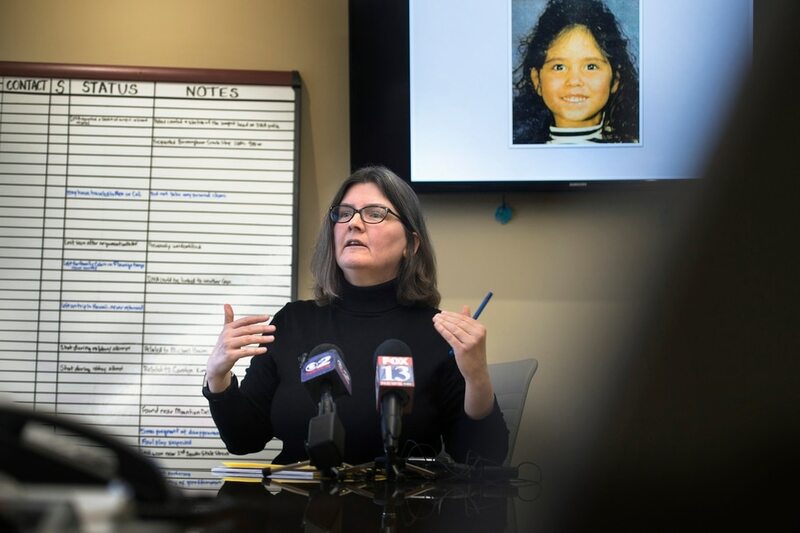 A new organization, the Utah Cold Case Coalition, says agencies could be doing a much better job sharing information and solving old homicides and disappearances. Attorney Karra Porter, a founder of the Cold Case Coalition, said Thursday that state Sen. Todd Weiler, R-Woods Cross, has agreed to introduce a bill during the upcoming legislative session that would establish such a database. It would be modeled on one adopted by Colorado in 2010, Porter said. In an interview, Weiler said he was surprised Utah doesn’t already have a cold-case database. “We owe it to the victims’ families,” he said. Levine and Roberta Tapia are the parents of 6-year-old Rosie Tapia, who disappeared 23 years ago. The case remains open and continues to weigh on the family. In the absence of a database, they have created a website, WhoKilledRosie.com, and set up a tip line, 385-258-3313, in an effort to help solve the case. Private investigator Jason K. Jensen, also a founder of the Utah Cold Case Coalition, explained why such a homicide/missing person database is important. He pointed to a 1999 case, where Nikole Bakoles was reported missing from her Midvale home. In October 2000, human remains were found along Interstate 80 near the Great Salt Lake. But no link was made between the two incidents, Jensen explained. It wasn’t until 2011 that investigators from the Unified Police Department made the connection: The remains were those of Bakoles. A central database would have linked the two much earlier, Jensen said. Utah does have a database on missing persons and unsolved homicides. But the Utah Bureau of Criminal Identification site is incomplete and out of date, Jensen said. Although law enforcement agencies can post information on the state site, it is not a legal requirement. For example, Sherry Black, whose high-profile 2010 murder remains unsolved, is not on the site. Creating a centralized system could be established using existing resources, Jensen said. And it would make information more uniform, complete and search-friendly. Although Porter and Jensen would like portions of the database made available to the public, that may not be possible. Salt Lake County District Attorney Sim Gill said a central database would be a good thing, as long as it doesn’t compromise the integrity of investigations. Weiler said he has discussed the proposed legislation with officials from the Utah Department of Public Safety to make sure a cold case database doesn’t compromise investigations. The bill is still in the process of being drafted, Weiler said, but it will be secure and open only to law enforcement. Correction: Jan. 18, 5:07 p.m.: An earlier version of this story misspelled the name of the state senator from Woods Cross. The correct spelling is Todd Weiler.